That’s exactly what happened to the staff at Bankstown City Council Civic Centre on July 1st, 1997. 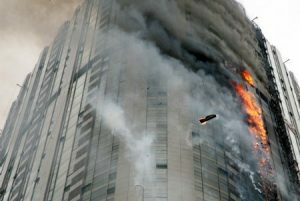 The fire destroyed much of the building and damages exceeded $30 million. Whilst water damage was extensive, many paper-based records were not destroyed in the fire, and computer data, including rate notices which raise $46 million a year for the Council – managed to escape damage from the emergency. The computer mainframe system’s on-site storage tape was also saved, allowing access to the data (even though it had to be sent to France to be recovered). If this emergency happened to your business, would you know what to do? It’s Not Just About Regulations, You Need Protection To! As an executive in any organisation, its not just meeting OH&S regulations and keeping the paperwork up-to-date that you need to concern yourself with. It’s the practical implementation of measures of an emergency management response framework, to ensure you can account for, and safeguard, your staff and visitors in all circumstances. We can show you how to develop an effective Emergency Management strategy for your organisation, encompassing Policy, Process, Team, Equipment, Testing, Training and Compliance. Regardless of the type of emergency affecting your premises, you need a fast and effective response mechanism; whether its a flood, fire, bomb threat or extortion attempt: Evacuate safely. Account for everyone. Undertake damage assessment. Determine next steps. We ensure that an emergency won’t impact in your business by providing the industry skills, expertise and knowledge to ensure that your business goes beyond mere compliance to emergency management standards, through to a workable plan. Are You Ready To Take Control And Find Out More About Emergency Management Planning? Complete the form below and one of our expert consultants will be in touch.